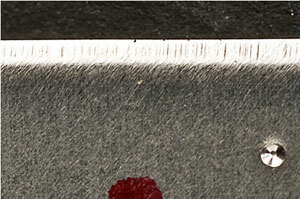 MIRROR CUT® is the revolution in Knife Sharpening Technology. Flamin' Sharp has taken sharpening to the next level and has delivered 21st century technology to a stone age problem. Knife manufacturing technology has come a long way in the last 30 years but unfortunately, up until the advent of MIRROR CUT® knife sharpening methods have not kept pace with these major changes. The Dry Grinding processes used by most sharpening providers today are the same as they were over 30 years ago and were the normal practice which was not such a problem with the old carbon steel knives with the wooden handles. Modern Knives are very susceptible to the Heat Related damage caused by these now outdated methods. Modern Stainless Alloy knives require a totally different approach regards sharpening. Flamin' Sharp recognised this problem and developed a process that has become the new bench mark for modern sharpening with MIRROR CUT®. Testing by Independent Engineers revealed that there are no adverse effects of heat related damage to our MIRROR CUT® edge compared to knives sourced and tested from our competitors. 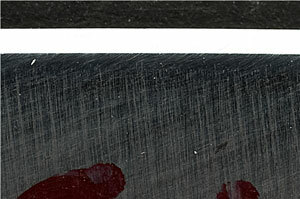 Flamin' Sharp also commissioned a series of photographs magnified 500 times, of a 5mm section of blade which clearly shows that the MIRROR CUT® edge has no visible 'Feather Edges' compared to our competitors with their edge clearly showing the effects of Dry Grinding with Scoring, Galling and the cutting edge resembling a wood saw. Wet Linish process = No Heat = No Chipping or Cracking. Less Friction makes for Easier Cutting. Superior Edge with remarkable Cutting Edge Retention. Minimal Metal Removal = More Life from your Knife. Less Sharpening = $$$ Savings. Click here to view further information on the advantages of using our MIRROR CUT'® technologies (This pdf will open in a separate window). Here at Flamin' Sharp , we are proud of our Trade Marked MIRROR CUT® Finish. Any of our friendly operators will be more than happy to show you how this Wet Linish system works and fully explain the benefits that will result for the longevity of your valuable knives.